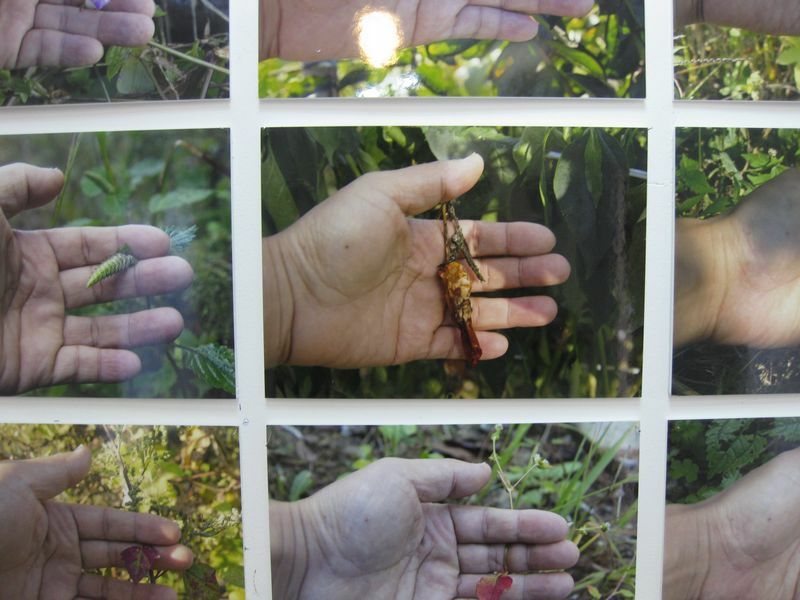 Recently we spent the day at the Yatoo Nature Artist’s International residence at the small village of Wongal. It was time for some of the resident artists to put their work on show, and what a show it turned out to be. Wongl Jeon from Korea and a founding member of the Yatoo group explained he wanted to give us all flowers. In a small gallery space this artist had prepared 22 coloured images of his hand open palm, each hand revealing a flower. It is autumn in Korea and yet Wongol found a great variety of flowers to present to us. 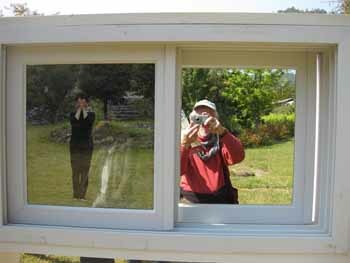 He led us to a field where he had erected a timer frame with two sliding window panes. Framing a view is always an effective way of focusing attention. However as we were to learn this work demanded audience participation. One curator/artist ventured forward and obliged by sliding one of the windows across the other only to be confronted by her own image in a mirror. The game had only just begun as where one expected to be able to see through the open window there turned out to be a third sliding window with an image of the artist seen at a distance in the gesture of presenting a bunch of flowers. There was magic in the air as more people tried to vary the sequences to find reality amongst multiple reflections. Ruti Raviv from Israel plays in the garden. She crafted a large ball from Chestnuts. Those of you who have attempted to collect Chestnuts will realise that this is a hazardous occupation given the multitude of fine extremely sharp prickles that form the nut’s outer casing. Not content with this Ruti also created a path or was it the shadow of a tree ( or was it both). She chose to make the path from small rounds she made from wood she had collected on the property. The path wandered about and at one point draped itself over a small rocky outcrop. Inspired by the natural environment, Ruti seeks to use only materials from the site thus making the work site specific and in harmony with the space. Peter Laurits from Estonia is an artist with a camera. Having made it on the world stage at one point in his life he retreated to a quite forested place in Estonia where he lived many years. Peter does not take pictures any more he prefers to ‘make’ pictures. One method he uses is to get up close and personal with nature by letting his camera wander about without his eye stuck to the view finder. In fact he does not want to see the view; he rather enjoys seeing what his camera conjures up. 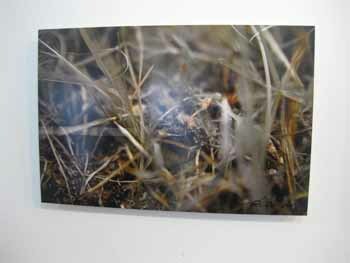 He selects few images and works with those he believes will develop into something engaging. When logic escapes him he turns to the I-Ching, The Chinese Book of Changes, using hexi-grams to help determine the way. An interesting artist with a background in theatre and drama all of which informs his current work. There was ample time at Wongol to ramble in the forest, make sculptures, make discoveries and relish the peace of this wonderful place. Artists are seldom happy unless they are experimenting or making something. 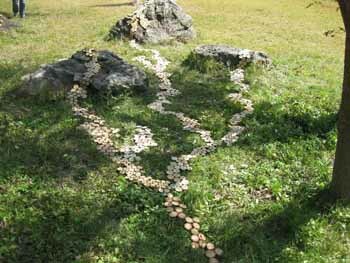 From the top of nearby hills to the bottom of shallow streams artists that day made site specific works aplenty. 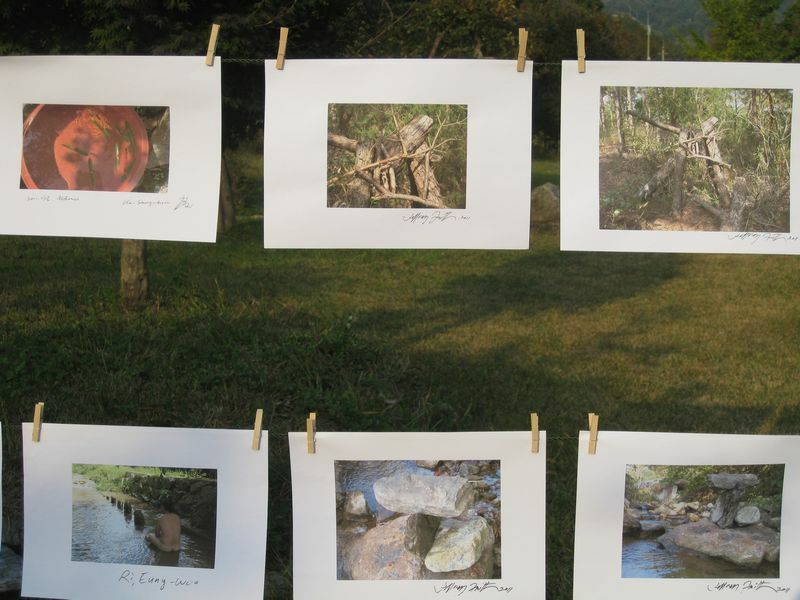 About 30 works were photographed and colour images printed on A4 sheets of paper then pegged on lines to create an impressive nature art show. 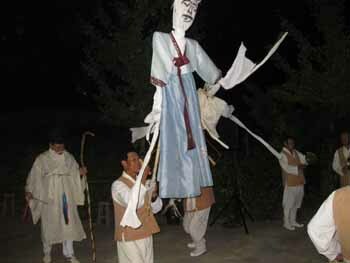 The local villagers dressed in traditional costume, carrying impressive drums and , turned up as the full moon was rising. They enjoyed the art on show and then proceeded to regale us with song and dance. The fun really started when they ran an impromptu drumming workshop for all the artists. They must have been pleased with our efforts as they insisted we drum for them while they danced and sang. WOW. What a night it was; one to remember. It may not have been The Met but it was a great way to blend in and spend time with a group of people to whom language was no barrier and whose generous spirit brought the whole valley alive.